Game developers have been to the edge of space, but Rovio has boldly gone where no ad has gone before—to the International Space Station. The video below, starring astronaut Don Pettit, promotes the upcoming version of Angry Birds that takes place in the depths of space, and has racked up more than a half-million views in its first 24 hours—bringing great exposure to both the game and NASA's continued work. In the clip, Pettit illustrates the pig-killing physics of deploying Angry Birds in a zero-gravity environment. 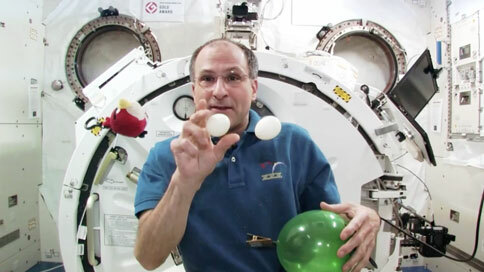 Even if you're one of the 15 people who don't like Angry Birds, you'll still enjoy the silliness of watching an astronaut slingshot bird toys across a $35 billion research facility. NASA isn't the only group hoping to use the new game as a chance to teach young people about space exploration. National Geographic has created its own Angry Birds Space book about astronomy, helping to show "the furious fliers everything they'll need to know on their quest to explore the galaxy and rescue their precious eggs."